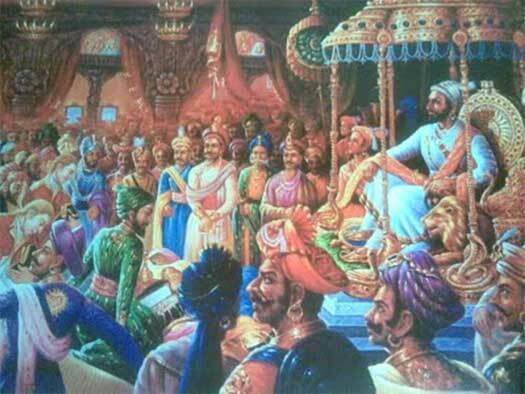 The coronation of Shivaji Maharaj was a watershed event in the history of Maharashtra. After a long hiatus during which foreigners had ruled, Chatrapati Shivaji Maharaj had managed to carve out a Hindu kingdom in an Islamic India. Those were troubled times. The foreign rulers had always displayed religious arrogance towards their Hindu subjects. Justice was never fairly distributed and lawlessness was rampant. Even their royal courts produced rival factions, with the Irani (Persian) / Turani (Central Asian) stock gaining precedence over the indigenous Hindustani. Their Hindu fief holders were more interested in retaining their estates and they turned a blind eye to the fanaticism of their masters. Hence there was a general feeling of discontent amongst the populace, albeit muted. However, people secretly desired a liberator. That was when Chatrapati Shivaji Maharaj arrived on the scene. Such was the personal charisma and persuasiveness of the king, that his every follower identified with his cause and joined him in large numbers. He gave them hope to cling to and a dream to cherish. He promised them a land that they could call their own, a land free of oppression and religious bigotry, a land in which justice prevailed, a land where people were heard and had their say. Of course it was to be a monarchy, but it would be a very benevolent monarchy. Eventually, it took Shivaji almost three decades to translate his dream into reality. His kingdom was duly named 'swarajya' or self rule. Though popularly known as Hindavi swarajya, it wasn't just a swarajya for the Hindus but a swarajya for all those who considered themselves to be the sons of the soil (sons of hind - Hindustan). According to the historian Sir Jadunath Sarkar, Shivaji's greatness lay not in his creation of a kingdom, but in the circumstances in which he created it (...from the survey of the conditions amidst which he rose to sovereignty). Shivaji's swarajya was accomplished amidst extreme adversity. This was something nobody had envisaged. After decades of enslavement, the most fierce of warriors had turned benign and resigned to their fate of subservience. This remained the case until the advent of Shivaji. He stirred them from their slumber and ignited in them the spark of freedom. After almost three and-a-half centuries of foreign rule (by the Afghans, the Mughals, or sultans of Persian descent), finally the people had a king who had risen from their own stock. To achieve his goal Shivaji had to tackle not one but two formidable empires. The Adilshahi sultanate of the south and the mighty Mughals of the north (not to mention irritations from the Europeans). It was no mean achievement by Shivaji. He was tremendously constrained in terms of resources and manpower. But nevertheless he succeeded in his quest by sheer grit, brilliant acumen, a daring approach, and an endurance of spirit. As the adage goes, luck favours the brave, and mother destiny too showered her gracious fortune on this entrepreneurial son of hers. 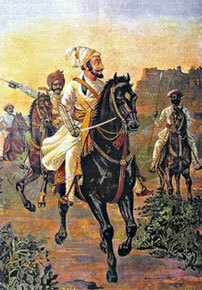 Shivaji's courage was rewarded with some early successes and his ambitions soared new heights. But one of Shivaji's great qualities was that, while his head always looked towards the sky, his feet were always firmly set on the ground. Shivaji was undoubtedly a very courageous person, but his courage was never impaired by recklessness. Instead it was embellished by caution. Like a seasoned general, he knew exactly when to attack and when to retreat. He was extremely circumspect while fighting the enemy. He did so with extreme cunning, a knowledge not just of his own strengths and weaknesses but also those of his enemy, something which he acquired through his resourceful spy network. Thanks to this, more often than not the time and place of his battles were of his own choosing, something which gave him a distinct edge over the enemy. Shivaji always proved to be a step ahead of his rivals. Starting as a teenaged leader of a band of young Mavales (inhabitants of the Maval region around Pune), Shivaji was quick to comprehend the geographical intricacies of Sahyadri terrain. He used these mountains virtually as his armour while battling some very daunting foes. Lightening in his movements, he swept down on his unsuspecting enemy and before the latter could react, disappeared into the darkness of the night or back into the thickly vegetated camouflage of the hills. Despite the colossal size of their armies and their great wealth, his enemies soon found themselves helpless against the brilliance of Shivaji's stratagems. Shivaji practised the Kautilya neeti of Chanakya, whereby the end was more important than the means. After all, his enemy was powerful and manipulative, and it was more often necessary for Shivaji to match deceit with cunning. He never made any pretensions towards chivalry or magnanimity when it came to his enemies (which history repeatedly shows has led many a great warrior to their fall), and crushed his enemies with ruthlessness. Even veteran generals such as the Goliathic Afzal Khan and powerful Shaista Khan found it difficult to match Shivaji in terms of guile and they soon found themselves at their wit's end. 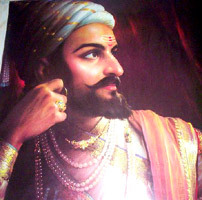 Shivaji was a born leader of men. He inspired loyalty in his soldiers to such an extent that many a gallant knight such as Tanaji Malusare, Baji Prabhu Deshpande, Prataprao Gujar, and Baji Pasalkar, readily sacrificed themselves at the altar whenever the need so arose. In fact no era ever witnessed such a regularity of martyrdom as during Shivaji's time. Though it is true that Shivaji was a devout Hindu who fought enemies, many of whom were incidentally Islamic by faith, it will be factually incorrect to label Shivaji as a Hindu zealot or anti-Muslim. On the contrary, his secular credentials were always impeccable. He regularly prayed at Muslim dargahs and sought blessings from Sufi peers such as Baba Yakut. Muslims were free to practice their religion in his kingdom without any hindrance. 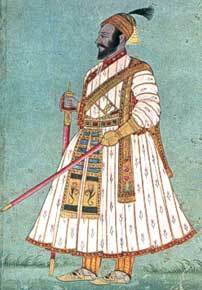 Shivaji was even magnanimous in allowing the tomb of his arch foe, Afzal Khan, to be built at the site at which he was killed. Never did Shivaji ever raze a mosque in victory or allow anyone to desecrate the Holy Koran during his raids. He disallowed the defilement of womenfolk even from the enemy camp. He had issued strict warnings to his men to refrain from such acts and meted out the strictest punishment to those found guilty of breaking these cardinal rules. This fact has been acknowledged even by the Mughal chronicler Khafi Khan, one of Shivaji's severest critics. Moreover, Shivaji freely employed Muslims in his army in various positions. There are examples of them reaching high positions, including Noor Beg, Haider Ali Kohari, Daulat Khan, and Ibrahim Khan to name but a few. But at the same time Shivaji never hesitated to take up cudgels for his Hindu brethren. His bold letter chastising Mughal Emperor Aurangzeb for the oppression of Hindus is quite well known. It wasn't a war between Hindus and Muslims as such, but more a war between the native inhabitants and the oppressive invader. Shivaji began his quest with a small hereditary fief, but increased it tenfold by capturing a large region that stretched from ghats bordering Pune to the coastal plains of the Konkan. It became all the more imperative that the Marathas declare their own king to rule this vast land. Eventually a pandit from Kashi by the name of Gaga Bhat suggested that the Rajyabhishek of Shivaji take place and Shivaji be crowned the king of kings, the Chatrapati. 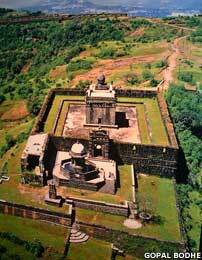 The coronation ceremony was therefore conducted on 6 June 1674, in Fort Raigad amidst great pomp and splendour. The English envoy, Henry Oxinden, who witnessed the ceremony wrote, '...This day, the Raja, according to the Hindu custom, was weighed in gold and poised about sixteen pagodas which money together with one hundred thousand more, is to be distributed after his coronation onto the Brahmins who in great number are flocked hither from all the adjacent countries...'. 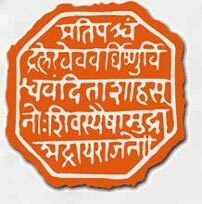 The Jedhe Chronicle mentions '...on 30 May 1674, Shivaji was invested with the holy thread and he married again according to the Vedic mantras'. Records also mention the presence of the heir apparent, Sambhaji, with Shivaji's queens, his mother Jijabai, and many royal attendees, dignitaries and soldiers. There were several elephants and horses present in the fort, as observed by Oxinden. Sabhasad mentions 'A golden throne weighing thirty maunds was made and inlaid with the choicest and the most precious jewels of nine kinds procured from the treasury... the total expenditure incurred in the cost of the ceremony amounted to one crore and forty thousand honas. The ashta pradhans (eight ministers) were honoured with a lakh of hon each besides an elephant, a horse, clothes and ornaments... thus the Raja ascended the throne'. Shivaji struck his own coins and inaugurated a new era called Rajyashaka. Also, Fort Raigad was declared the new capital of the kingdom. A blueprint of the proposed administration of the kingdom was drawn out. It was executed by Ranganath Pandit and was called the Rajyavyavaharkosh. But tragedy struck Shivaji when he lost his mother, Jijabai, hardly within a month of the coronation. Shivaji considered it a bad omen and re-conducted the coronation ceremony, this time as per tantric traditions. The ceremony was conducted by one Nischalpuri Gosavi. This ceremony was, however, a very simple affair and lasted just for a day. Shivaji didn't rest on his laurels and conducted several successful incursions into enemy territory in the south (northern Karnataka, and Ginjee in Tamil Nadu), which brought him more territory, wealth and glory. Shivaji could have achieved much more if his eventful life hadn't been cut unexpectedly short. He fell ill and breathed his last on 3 April 1680, almost six years after his coronation. He was just fifty-three. Shivaji left behind a legacy. A legacy which empowered the future generations of Marathas, providing them with a self-belief that propelled them to rise as major force in the political scene of a greater India. The views expressed here are the author's own. They may not reflect the views of others and no inference should be made that this is the case.